David ‘Avocado’ Wolfe is set to arrive in Australia, so now is as good a time as any to join the”Don’t Cry Wolfe” movement. I first read about this at the start of 2016; a year on, I think we should all take the pledge. It’s really simple; stop sharing things on Facebook from the page of David ‘Avocado’ Wolfe. If you don’t know the page I mean, check your Facebook news-feed. All those viral memes and videos full of inspirational quotes? If they aren’t branded with David ‘Avocado’ Wolfe’s name, they soon will be. I could (and probably will) say many things about the man but I have to say, he has social media down pat. If something is getting a lot of traction, he wastes no time in ripping it off, pasting his name on it and sharing it to his 9 million+ followers. See the logo in the corner? Who is David ‘Avocado’ Wolfe? He is the self-described “rock star and Indiana Jones of the superfoods and longevity universe“. Does that clear up that question? Yeah, no, not for me either. He was the spokesmen for Nutribullet; an over-priced blender that claims to “extract nutrition” by blitzing up fruit and veg- much like any other powerful blender. He is associated with several websites including an online store, The Longevity Warehouse, selling everything from vitamin supplements to bedding that claims to “connect you to the Earth’s natural energy” to even more dubious products (“Longevity Zapper”, anyone?). His ” superfoods” are apparently “artisanally-sourced” and I’m not sure why it is desirable to have an artisan find your food, but anyway, that’s not the point. David ‘Avocado’ Wolfe sells nonsense. They say a fool and his money are easily parted, so who am I to object to that? To understand the problem with sharing Wolfe’s seemingly harmless memes and videos, you need a very basic understanding of Facebook reach. Each time you like, comment on or share a post, it puts that post into the news-feeds of your friends. Without delving into the complicated algorithms that Facebook uses, a comment or a like is a kind mini-share. So every time you interact with a post on Facebook, you’re essentially sharing that with a portion of your Facebook friends. If you’re still scratching your head about why this is a problem, think about your friends. We all know someone who is perhaps a little naive. Maybe you know someone with a sick family member who is willing to try anything to get better. Maybe your friends do. So each share leads more people to his page. And each person who finds there way there will be potentially influenced by his memes or find their way to his store or others of a similar nature. 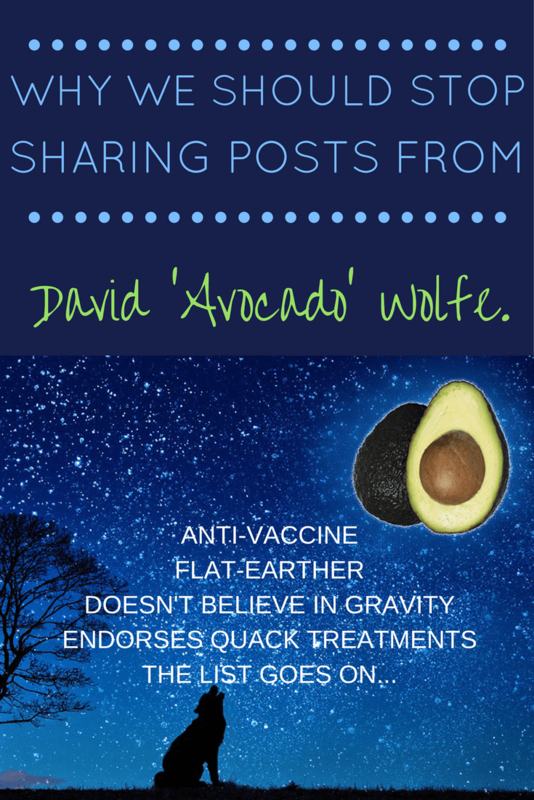 What’s the harm in sharing from David ‘Avocado’ Wolfe’s page? Following his page and sharing a feel-good post here and there might seem pretty innocuous. People like to feel inspired and good about themselves, right? Cute pictures, funny videos, quotes, shareable sentiments- all fairly harmless. But in among the feel-good stuff, you’ll find something else. A clear anti-science vibe, if you will. Claims about herbs and spices curing illness. 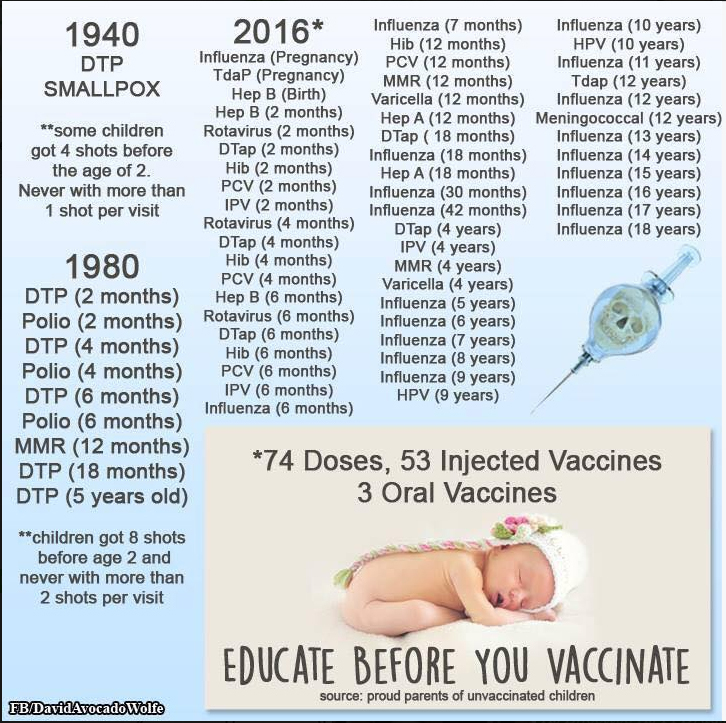 Anti-vaccine posts. Flat Earth nonsense. Anti-media, anti-government- you name it; it’s there. Aside from the memes and dodgy products with his face on them, Wolfe has a blog full of articles to match. These range from anti-vaccine to anti-cancer treatment and everything in between. And every time you like or share something he posts on Facebook, you are potentially leading more people to these products and blogs. While subtly reinforcing the idea that modern medicine is evil, ineffective, dangerous or corrupt, Wolfe is conveniently helping to sell alternatives. It’s a funny thing; Big Pharma and all their “science” are just trying to make a profit from sick people. The government is in on it for their slice of the pie. All of their “evidence” is corrupt, fraudulent or just lies. Alternative remedies, devices and supplements, however? Well, they aren’t made by Big Pharma so they must be fine, right? They aren’t corrupted by things like evidence, no matter how much of a word-salad people like David ‘Avocado’ Wolfe surround them with. Instead, they are unproven, unlikely and expensive. The aforementioned “Longevity Zapper”, a device that has 2 copper discs on it and is recharged by plugging it into a USB drive. It’ll set you back a cool few hundred US dollars and in exchange, it zaps you with low voltage electricity all day. Why? To “boost your immune system”, of course. There’s no evidence to support this and a list of warnings about correct usage to avoid burns as well as a disclaimer calling it an “experimental” product that wont actually treat any condition. The disclaimers tucked in behind every vague product description speak very loudly. They tell me that David ‘Avocado’ Wolfe is well aware of the snake oil he’s selling. Is a ‘like’ an endorsement? So many fans give David ‘Avocado’ Wolfe an enormous platform to draw more people in. Each share or like, thanks to Facebook algorithms, gives him a free bit of advertising. Of course, liking or sharing something on Facebook doesn’t mean you endorse the person who posted it… Does it? Does it lend people like him a legitimacy that they don’t deserve? If you consider a person to be intelligent and rational, are you more inclined to trust what they share online? Are there times when even the most skeptical people are less inclined towards rationality and logic? Absolutely. Back when my Mum was dying from cancer, I became an avid researcher of any and every possible hope. Organic food, a diet consisting solely of blueberries, shunning the microwave, not using cling film, manuka honey on everything (which conflicted with the “sugar feeds cancer” myth), alkaline water, SLS-free shampoo, reflexology,” medicinal” mushrooms, “superfoods”… You name it, I looked into it. I considered things that my rational mind recognises as utterly ridiculous, because I needed hope. I am generally pretty skeptical but impending grief, fear and anxiety isn’t always an optimal mix for a logical approach. Take the pledge to stop sharing, liking or commenting on his posts on social media. David ‘Avocado’ Wolfe isn’t the only snake oil salesman on the internet. But he is one of the most recognised on social media. What would happen if people stopped following his page or liking and sharing his posts? Maybe fewer people would waste their money on “Longevity Zappers”, for one. Perhaps there’d be less of a push toward anti-science conspiracy theories. Maybe more people would see their actual doctors for illnesses and less would try to treat dangerous health conditions with unproven and potentially dangerous remedies. I’d like to think that no one would base a health decision on a Facebook post, but reading the comments sections leads me to believe that I’m probably wrong. So let’s make it less likely. Let’s not expose our friends to dangerous quackery through what we share online. ← Manshoosh: Shut Your Mouth!